- Single Trip Rates may be found on our Rates Page. 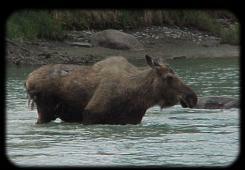 - FAQ's about our Alaska Fishing Trips. All of our fishing trips are available on a single trip basis, or if you wish to fish for several days, we have a number of vacation packages available for you offering multi-day discounts. Below, you will find a listing of our fishing packages, with or without lodging included. We have a number of options available for substitutions or add-ons as well. Please note that if you'd be interested in a package configuration that is not listed below, let us know and we will be happy to design a package designed for your individual preferences. Always be sure to check our Specials Page to see if we have a current special on a package listed below! These are standard options, please note popular options below package listings for each season - we're also happy to design special package configurations not listed here! Halibut trips are generally 8 hours, depending upon tides and fishing action - May halibut trips include trolling time for king salmon! Please note that all rooms at 'The River' run $20 nightly more per person than standard package rates. High Season (HS) Rates Apply to any packages with a beginning / ending date falling between 7/10-7/31. You may choose any combination of salmon and halibut fishing trips, one daily. Substitute River Salmon and Razor Clamming Combo for a day of fishing: add $45. Limited availability based upon tides. Substitute Kenai Fjords Glacier / Wildlife Cruise w/ salmon bake lunch stop for a day of fishing: subtract $35 per changed day. Substitute Sea Kayaking / Wildlife Cruise Combo for a day of fishing: subtract $30 per changed day. 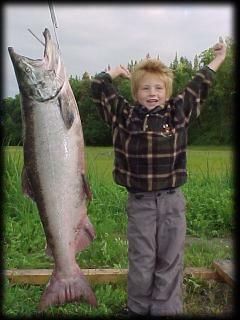 Substitute "Half Day" of King or Sockeye Salmon fishing (6 hours) for a day of fishing: subtract $60 per changed day. Substitute "Power Day" of King Salmon or Combination of King and Sockeye fishing (12 hours) for a day of fishing: add: $60.00 per changed day. Add one night or more of lodging: add $85 per person / nightly $100 in High Season. Premium Trip add-ons. Adjustments per day. Please note that all cabins at 'The River' run $25 nightly more per person / nightly than standard package rates. Full Day Seward Combination saltwater trips - species may include silver salmon, halibut, lingcod, and other rockfish.